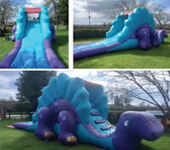 Bouncy Castle Hire for Kids & Family Parties, Fundays and Fetes. Welcome to the Big Bounce website. We are a reputable, family run business operating in the Shropshire, Herefordshire and Worcestershire borders, covering areas such as Ludlow, Craven Arms, Cleobury Mortimer, Tenbury Wells, Leominster, Clee Hill, Bewdley, Kidderminster and all surrounding areas. Our customers include charities, local business, local authorities, playgroups, schools, football teams and rugby clubs. We will deliver and collect your inflatable at a time convenient to you. We also offer an organised and responsible manning service of our inflatables where we give the organisers a donation.